Sales of the all-electric Model S are giving Tesla a jolt. The Model S is a full-size, four-door luxury sports sedan. While it was unveiled in 2009, it wasn't available until last year. Tesla has sold roughly 7,000 Model S cars since then. 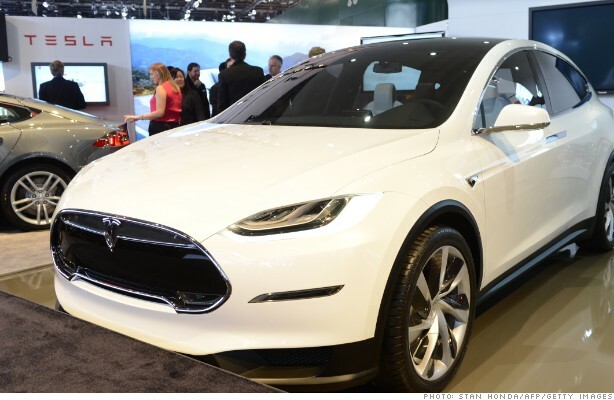 Investors may also be liking the latest driver-friendly warranty being offered by Tesla. In a bid to draw in even more buyers, the automaker is offering a 'no fault' warranty for its Model S batteries. And it's come up with new financing options for the Model S to make it even easier (and cheaper) to buy the plug-in vehicle. Tesla shares have gained nearly 70% this year. Tesla CEO Elon Musk loves to take to Twitter to make announcements and engage with consumers. @elonmusk has more than 191,000 followers. He's not alone. StockTwits traders took to the airwaves to cheer Tesla on. $TSLA ha been undervalued for years. Just making up for lost time recently. Earnings will be short squeeze catalyst. This is just a warm up. That's a good point. There are probably a bunch of naysayers out there who now wish they had placed big bets on the stock rising instead of falling. I can't rightly answer that. But I can say it seems to have a bit more room on the upside. Though, many StockTwits traders are calling out the shorts for "squeezing" the stock at this level. That may very well be playing into today's pop since there isn't any definitive news. But I also think there are those who want to get in before the earnings release.